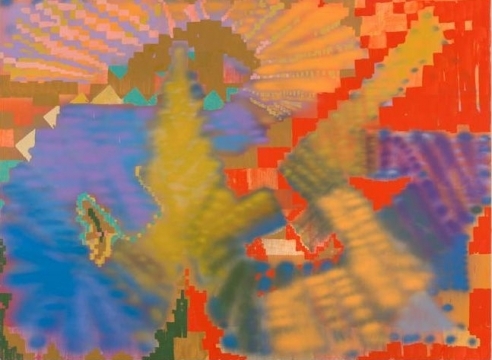 NEW YORK, July 13, 2015 – Mitchell-Innes & Nash is pleased to present its second solo exhibition of work by Brooklyn-based artist Keltie Ferris. 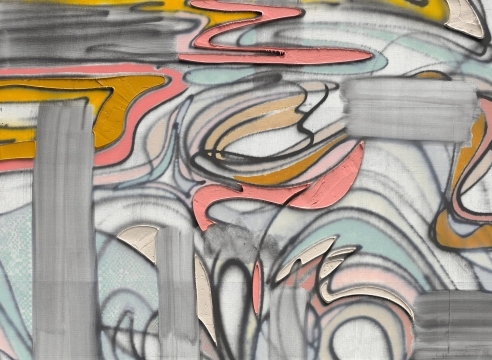 The exhibition will include approximately a dozen new paintings made during a recent stay in Los Angeles, California as well as a number of the artist’s body prints—Ferris’s ongoing series of unique works on paper. This will be the first time Ferris’s paintings and body prints will be exhibited together. The exhibition will be on view at the gallery from September 10 through October 17, 2015. The new body of work features Ferris’s expanding investigation into painting as a multiplanar site for constructed light and shifting space. Akin to her earlier layered compositions, these new works are built from discrete, integral marks that solidify and dissolve between mass and landscape. Expanding her range of mark making in scale shifts and close ups, Ferris couples syncopated brushstrokes with airbrushed oil paint to create surfaces that combine the topography of textiles with the banter of gestural mark making. In her body prints Ferris explores painting as a personal index. Using natural oils, pigments, and her whole body like a brush, Ferris presses herself onto the paper. Through minimal materials and the ambiguous impressions of her imprint, Ferris literalizes and reifies the relationship of an artists’ identity to the work that she or he produces. Together the new paintings and body prints ask how the artist might be conveyed in the presence of a single mark – a smear, a press, a drag, a spray – and whether collectively these marks can be experienced as a fixed space or single body. 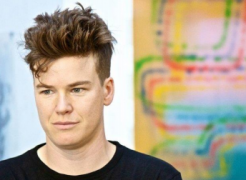 Keltie Ferris lives and works in Brooklyn, New York. She received her MFA in 2006 from Yale School of Art and her BFA in 2004 from Nova Scotia College of Art and Design (NSCAD). Recent solo exhibitions include Keltie Ferris: Doomsday Boogie at the Santa Monica Museum of Art, and Body Prints at Chapter NY, New York. 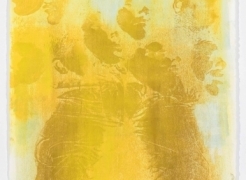 Her works have been included in group exhibitions at institutions such as Contemporary Arts Museum of Houston, Texas; Brooklyn Museum, New York; and Indianapolis Museum of Contemporary Art, Indianapolis. She was recently awarded the Rosenthal Family Foundation Award in Painting by the Academy of Arts and Letters, where her work was included in their 2014 Annual Invitational Exhibition of Visual Arts. She has an upcoming solo exhibition at the University Art Museum at the University of Albany, NY opening in February 2016. Mitchell-Innes & Nash’s renowned exhibition program, in both their Madison Avenue and Chelsea locations, fosters excellence within artistic practice, while forging an informed dialogue between emerging and established internationally recognized artists. From acclaimed surveys of 20th century masters, such as Jean Arp, Anthony Caro, Jay DeFeo, Willem de Kooning, Leon Kossoff, Kenneth Noland, Roy Lichtenstein, and Nicolas de Stael, to solo exhibitions of Sarah Braman, Keltie Ferris, Daniel Lefcourt, William Pope.L, Martha Rosler, and Jessica Stockholder, Mitchell- Innes & Nash has proven expertise in both advancing the careers of emerging artists and maintaining the superior standard set by established artists. 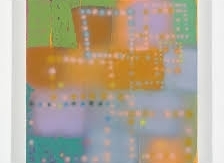 Image credit: KELTIE FERRIS, [to be titled], 2015. Courtesy of the artist and Mitchell-Innes & Nash, NY. Listings Information: Mitchell-Innes & Nash is located at 534 West 26th Street in Chelsea and 1018 Madison Avenue on the Upper East Side. 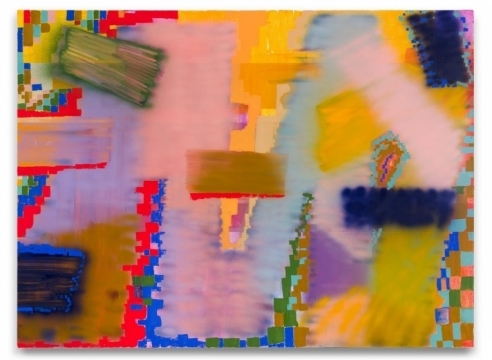 Keltie Ferris continues to make some of the jazziest abstract paintings around. 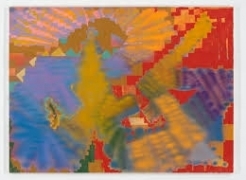 Several are absolute knockouts, combining blurred passages of spray paint with massed rectangular patches that suggest blown-up pixels created with a computer paint program. “There's a weird culture where works on paper aren't respected the same way as paintings are,” said Keltie Ferris, walking through her latest exhibition at Mitchell-Innes & Nash, which pairs vibrant mixed-media canvases with more intimate body-prints. “This show is about whether these two bodies of work, which were feeling disparate, can hang together. 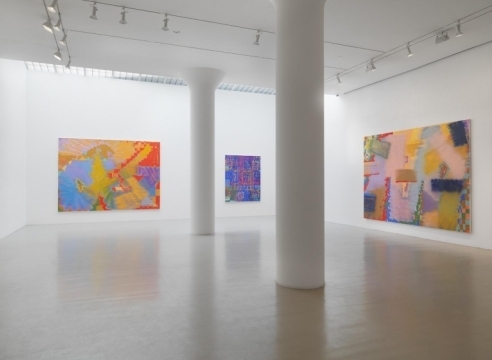 At Mitchell-Innes & Nash, meanwhile, Ferris continues to stake out her position as one of today’s finest abstract painter with ever larger, ever more exuberantly colored pieces, where shifting blurs compete with crisp, thick pointillist passages. 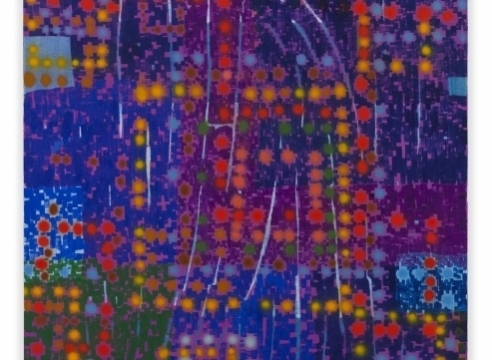 Vibrating with punchy oranges, purples, and pinks, these paintings look like aerial views of futuristic cities, acid–inspired quilts, or glitch-laced JPEGs. Frankenthaler and Gilliam are forebears, but Ferris pushes, with great aplomb, beyond those influences, forging a style that feels bracingly, thrillingly fresh, and one in which space ambiguously slips and slides. La Estrella, [P]y[X]i[S], oRiOn: We’re caught up in the jumbled syntax of the heavens in Keltie Ferris’s dazzling show of ten paintings and six body prints, all from 2015. The constellations that lend their name to some of these canvases trace distinct forms but are composed of flickering stars whose boundaries are less clear to us down on Earth. And this is a central aspect of Ferris’s paintings, whose thin airbushed oil layers and dragged acrylic strokes build a rich color space (here, moving beyond the loose neon graffiti of her 2012–13 gallery show into deep purples, reds, ochers) that shifts in and out of focus. Are these shapes or are they impressions? This has been a summer of women warriors: Serena Williams, Angela Merkel, Charlize Theron’s character in “Max Max: Fury Road,” and Shaye Haver and Kristen Griest, the first women to earn the United States Army’s elite Ranger designation. Now, in the final days of summer, painting’s warrior women are advancing, and Keltie Ferris is among them. Brooklyn-based painter Keltie Ferris creates marks—smeared, sprayed and hand-painted—that solidify or dissolve into abstractions with a sense of perceptual depth that allows for multi-dimensional readings. The 38-year-old artist returns to Chelsea gallery Mitchell-Innes & Nash for her second solo exhibition (Sept. 10-Oct. 17) with several new works created during her recent trip to Los Angeles. A former Yalie who has taken the art world by storm with her fizzy Technicolor abstractions, rising star Keltie Ferris is back with her second solo show at this gallery. The colorful exhibition will include 12 new abstract paintings that she made during a recent stay in Los Angeles, as well as several of the artist’s figurative body prints on paper. The large abstractions mix lively brushwork with bold spray painted areas, while the works on paper (inspired by the body prints of David Hammons) capture the imprint of Ms. Ferris’ clothed body with pigments and oils over a network of brushed, linear forms. This fall, Ferris’s paintings and body prints will be shown together for the first time in her second solo at Mitchell-Innes and Nash in Chelsea. As she prepared for that exhibition (opening September 10) and two other upcoming shows at the University Art Museum in Albany and Klemm’s in Berlin, Ferris welcomed Artspace's Karen Rosenberg to her Bushwick studio to talk about her embrace of body art and what it means for her paintings.